Here's a kit that will make your life a wee bit easier. If more often than not, you find yourself looking for wood drill bits, sockets, screw driver, hammers etc. either to fix something up or just to change the way your house looks, then this 121-pc tool kit is exactly what you need. It would be your best companion on the lazy days when you finally decide to repair the broken objects that clutter your house or those that could actually be put to some good use when refurbished. Be it plumbing, drilling, or any other odd job that requires a service provider, this kit will help you do it all yourself, and save your hard earned money at the same time. 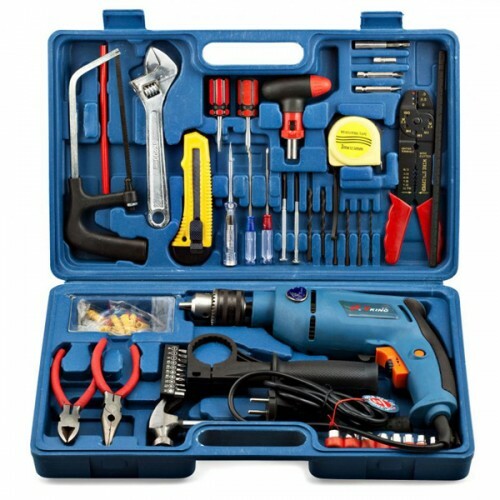 You get a complete tool kit with this drill machine which will ensures you are not dependent on anyone when it comes to mending odd chores example plumbing, drilling, and so fore. This drill machine has an ergonomic design with optimal grip position. It is decent in weight and can be used for multiple tasks. The drill machine has an Insulated shock proof plastic body which makes it safe to use. The drill machine has a powerful motor and high impact rate for fast, effortless masonry drilling. The combination tool kit comes with bits of various sizes which are easy to change. It is an effective & decently weighted corded drill machine which can be used for routine home improvement activities without having to call the carpenter every time for minute processes like drilling a hole in a wall or fixing the furniture. The product is useful for drilling small holes into wood, metal, brick walls to fix paintings, shelves. This product makes you self sufficient to take care of your daily chores or odd jobs without having to call a service provider or a mechanic - enabling you to save on money and cut cost simultaneously. Save time and make your house look perfect with this 10mm drill machine. Put up your precious paintings, set right your furniture or simply work around your home.